As part of an ongoing study on the use of ICT for disaster preparedness and response in ASEAN countries, ADRC has recently visited Hanoi, Hue and Ho Chi Minh City in Vietnam to interview experts at various government's institutions, including Vietnam Ministry of Agriculture and Rural Department and Ministry of Natural Resources and Environment, and collect information relevant to this subject. 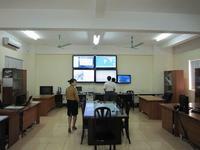 The use of ICT for disaster preparedness and response has been making a steady progress in Vietnam, in particular weather forecasting and monitoring, risk assessment and risk mapping, early warning to communities and people, etc. Moreover, state-of-art ICT technologies have been widely applied such as broadband networking of observation stations and automatic communication by mobile phone, but mostly on an experimental basis. While good progress has been made for typical meteorological and hydrological hazards such as typhoon and flooding, relatively less progress has been made for landslide, flash flood, and geological hazards such as earthquake and tsunami. Among them, tsunami warning system (towers) has recently been developed in Da Nang city in Central Vietnam, but more has to be done in view of future tsunami risks in its long coastal line. Likewise, disaster preparedness and response capacity could be further enhanced if it would make more use of such ICT technologies as information sharing system among various institutions, remote sensing, imaging system, real-time measurement sensor, etc. The result of the study will be used as a basis on which further cooperation is planned. We appreciate greatly kind cooperation extended by the Disaster Management Center (DMC) of the Ministry of Agriculture and Rural Development.